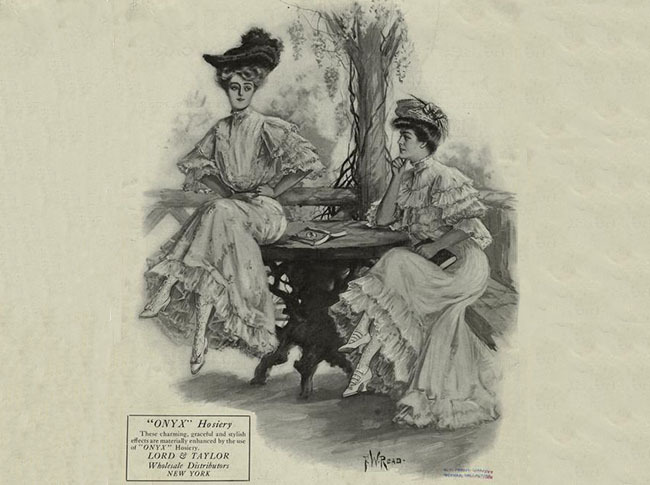 1906 advertisement for Onyx-brand hosiery sold at Lord & Taylor, New York, with illustration by F. W. Read. Image courtesy of New York Public Library Digital Collections. About eight years ago there fell accidentally into my hands a volume of Maupassant’s tales. These were new to me. I had been in the woods, in the fields, groping around; looking for something big, satisfying, convincing, and finding nothing but—myself; a something neither big nor satisfying but wholly convincing. It was at this period of my emerging from the vast solitude in which I had been making my own acquaintance, that I stumbled upon Maupassant. . . . Here was life, not fiction; for where were the plots, the old fashioned mechanism and stage trapping that in a vague, unthinking way I had fancied were essential to the art of story making. Here was a man who had escaped from tradition and authority, who had entered into himself and looked out upon life through his own being and with his own eyes; and who, in a direct and simple way, told us what he saw. When a man does this, he gives us the best that he can; something valuable for it is genuine and spontaneous. He gives us his impressions. The influence of Maupassant’s stories on Chopin’s writing is substantial—particularly their emphasis on psychological character development. The mammoth Oxford Book of Women’s Writing in the United States avers that her “accurate portraits of Victorian and turn-of-the-century women have never been equalled for the depiction of women’s interior conflicts.” And, like Maupassant, Chopin often employed the surprise or disconcerting ending. Yet Maupassant’s naturalism had a reputation among American readers for being “racy,” and the earthy or sensual elements that found their way into Chopin’s prose made editors nervous. * Only a small part of Chopin’s essay, in a heavily revised version, was published in the January 1899 issue of The Atlantic, under the title “In the Confidence of a Story-Writer.” The above excerpt is from a surviving manuscript version reprinted in The Complete Works of Kate Chopin (1969). Note: Blue-points, mentioned on page 819, are oysters from Long Island, NY, usually served on the half-shell. Little Mrs. Sommers one day found herself the unexpected possessor of fifteen dollars. . . . If you don't see the full selection below, click here (PDF) or click here (Google Docs) to read it—free! Found this selection to ooze sentiments of feminine rebellion and at the same time declarations of independence. Beautifully written. The preceding reader says it well. Chopin is inviting. Yet also sadness waits, & we the readers reach it well-ahead of Mrs. Sommers.